I once spent a thunderstorm riddled night at Codorus in a tent. I taught my sons how to determine approximately how far away the lightning was by counting the seconds between the flash and the thunder. Drive into Hanover and take the Utz Snacks Factory tour. A visit to the Harley-Davidson plant in York, PA is worth the ride. However, please be advised that there are age restrictions and dress requirements for the factory tour. Too bad you're a little early to enjoy the swimming pool. Codorus is one the few PA state parks that has one. I wish it had been a good thunderstorm this time, but we took what we got and made the best of it. Spent today hiking around and geocaching. Such a beautiful park. Thanks for the tips on the area! If you're willing to travel a bit west, visit Cowans Gap SP, located north of McConnellsburg, PA off of PA-75. 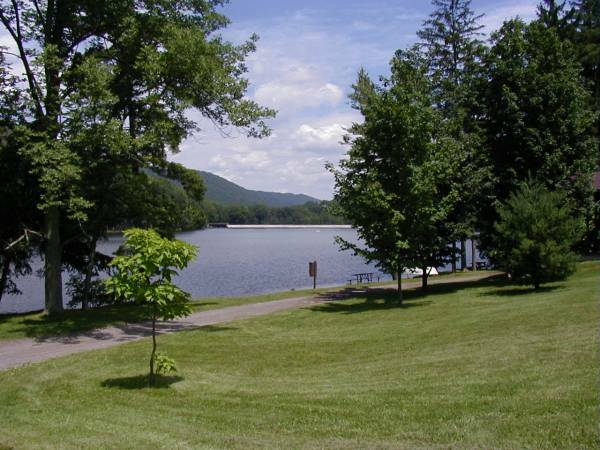 It's nestled in a picturesque mountain setting with a lake of about 50 acres. Everything there is in walking distance. It's easy to reach from either the PA Turnpike or US-30. I had to share these, took these as we were getting ready to head home. We were having a picnic near the pavilions and I was playing with my daughter in the grass and looked up an noticed the ring around the sun. Never seen anything like it!